I arrived in the UK nearly two years ago to take up my responsibilities as Ambassador. During that period this is the ninth time I have spoken at a global top 100 university. But today’s experience is unique. The reason is that all the other eight universities were British. 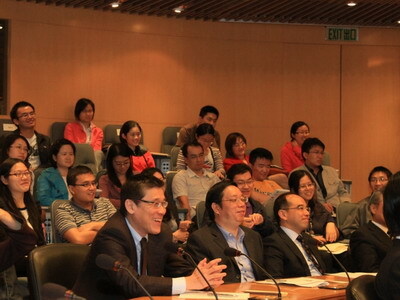 Today CUHK offers me the first opportunity to speak to a top world university on Chinese land and in my native language. I have had the privilege of serving China as a diplomat for 40 years. This has taken me to North America, Africa and Europe. 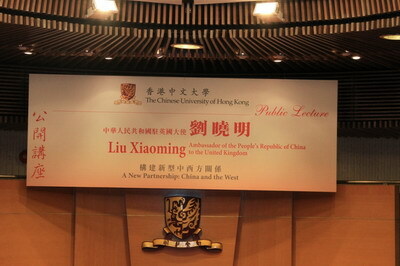 My experience gave me a front-row seat to witness how China’s relationship with the West has evolved for decades. Today, I have increasingly felt this relationship to be at a crossroads of trust and cooperation. 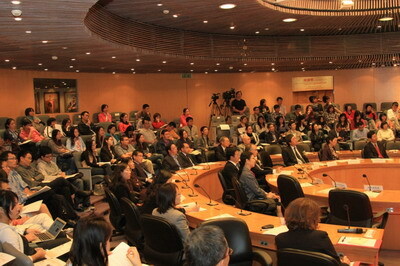 Hong Kong is a well-known meeting point of China and the West. This connecting point is reflected in the core beliefs of CUHK. Your university is committed, ‘to combine tradition with modernity, and to bring together China and the West”. This mission of CUHK gives me a unique platform to share with you some thoughts on the relations between China and the West. The engagement between China and the West harks back to a distant past. But it’s only from the Opium War of 1840 that deeper exchanges, both positive and negative, began. Since then, our relationship has traveled an extraordinary journey and undergone a vast change. The most impressive change is the transformation of China’s status. One century ago, China was at the mercy of imperial powers and its territory was carved into spheres of foreign influence. Hong Kong, the Pearl of the East, was ceded to Britain as a colony for 155 years. Shanghai’s foreign concessions became notorious for their signs warning: ‘Dogs and Chinese Not Admitted’. And China was coerced to accept one unequal treaty after another by western powers. China’s first senior diplomat posted abroad was the Qing government’s minister to Britain called Mr. Guo Songtao. He is my earliest predecessor. Instead of being part of the ministerial-level diplomatic relations, his posting resulted from an unequal treaty the Qing government was forced to sign with Britain. In early 1875, British diplomat Augustus Margary was killed in a conflict with locals in Yunnan. The British government asserted it was an orchestrated assassination by the local authorities and pressured the Qing government to sign the Chefoo Convention. Under this convention, China was required to pay 200,000 silver dollars, open four treaty ports and send a mission of apology to Britain. The Qing government had no alternative but to accept all the demands and, as a face-saving tactic, appointed the head of the mission China’s first diplomat stationed abroad. But when Guo Songtao was preparing to hand Queen Victoria his letter of credentials in early 1877, he found all he carried was an apology letter of the Qing government. Britain, however, accepted the apology letter as a de facto letter of credentials. The disgrace surrounding the whole event was a revealing example of the state of China’s relations with the West at that point in time. At the same time, the West labeled China as, ‘the sick man of East Asia’. Western people used this description to illustrate in China the poverty, weakness and people’s poor health. Before the founding of the New China in 1949, the Chinese people’s lifespan was only 35 years old. In addition, the Chinese had never won any Olympic gold medal. Today, China’s relationship with the West has been rewritten. China’s economy is booming and its national power is on the rise. It’s the world’s second largest economy, leader in global exports and the biggest holder of foreign currency reserves. China sits on the UN Security Council as one of the five permanent members and is an important player within the G20. We carry considerable weight in world political, security and economic affairs. Today, the title of ‘the sick man of East Asia’ has long been thrown into the scrap heap of history. In turn China has advanced in ways unprecedented in the whole of human history. Chinese people’s life expectancy has reached 73 years old and may rise to 74.5 toward the end of the 12th Five-Year Plan, closing in on the Western average of 76. Chinese mainland’s basic medicare system has become the largest in its kind, benefiting 1.25 billion people. As recently as 40 years ago China was close to being negligible in the trade and investment pattern of the West. Yet today, China has emerged as Europe and America’s most important trade and investment partner. We are Europe’s second largest export market and number one source of imports. Looking across the Pacific Ocean we are America’s third largest export market and number one source of imports. Meanwhile, China and the West have seen their people-to-people contacts reach greater depth than ever. On a daily basis there are at least 13 direct flights between China and Britain. Each day over 9,000 Chinese and American travelers fly over the Pacific. China has 120,000 students in Britain and roughly 130,000 students in America. Britain today hosts 17 Confucius Institutes, and there’re another 120 in Europe and 70 in America. In world affairs, the West’s shift of attitude towards China has been profound. The developed countries did not want China to have a voice in the past. Then they began to view China as a regional power. Today, the West has increasingly recognised China’s global power status. The consensus view has emerged that many global challenges and crisis issues will fail to find solutions without China’s participation and support. Indeed there is broad recognition that world prosperity and stability need China’s active participation. That’s why China and the West are building closer collaborative ties through consultations in global affairs. China’s relations with the West have gone through great changes over the past century. Today, China’s development calls for a good relationship and close cooperation with the world the whole world and not just the developed countries. As I have described there has been much positive progress over the past three decades. But there have been many challenges to overcome to secure this advance. China’s relations with the West have experienced frequent setbacks and tensions. These can result in dramatic media headlines. Why is that? It seems to me there are two reasons that deserve our attention. One major reason is the Western mentality. For centuries, the West dealt with a weak China in a condescending way. Today, the West is not so comfortable with a stronger China and is showing increasing unease and anxiety. Their approach is along the lines that, ‘power means hegemony.’ Increasingly Western people are concerned about China’s competition for global leadership, resources and energy. In recent years, we have heard so many versions of the ‘China threat’. This manifests itself as China’s ‘military threat’, ‘economic threat’, ‘energy threat’, ‘environmental threat’ and ‘cultural threat’. This year, the temperature is rising on China’s ‘cyber threat’. China is billed as a culprit behind hacking activities and cyber spying. The West also tries to demonise China’s commercial cooperation with Africa and calls into question China’s ‘neo-colonialism’. Sensational as it is, the case of the ‘China threat’ is self-contradictory. More recently, the West is talking about ‘China’s responsibility’ and presenting to China headline grabbing titles such as ‘G2’ and ‘CHIMERICA’. Mr. LU Xun rightly cautioned the Chinese. He said there are those who ‘talk you up’ and those who ‘sell you short’. China needs to keep a cool head and clear mind about such traps. The strains on our relations between China and the world also derive from the Western reluctance to recognise China’s uniqueness. There shouldn’t be any surprise about the different systems of China and the West. This is a reality shaped by our different histories and national circumstances. The sticking point now is the Western belief in its superior and ‘one-size-fits-all’ model. In this sense, an orthodox form of democracy must be western. These values reflect a perception that every governing system needs to have such visible attributes as ‘checks and balances’ and ‘one man, one vote’. The West judges the rest of the world by its own standards. It is at pains to force their standards on others. With that approach comes a failure to see the larger picture, such as China’s political reform, economic openness, human rights progress and social diversity. I explain to my British friends that the Chinese believe in the wisdom of Confucius. I tell them Confucius described how, ‘among any three people together, there must be my teacher’. But the prevailing belief in the West is the reverse! The Western view is that, ‘among the three people together, I must be the teacher’. In the Western world there is a continual failure of scrutiny of its own performance and progress. The maelstrom released by the global financial crisis that started three years ago is striking evidence of the failures at the core of the Western model. The crisis is a wake-up call to the West and these events have exposed the failings in its economic, social and political institutions. The West has no shortage of visionary voices about China’s development. Many years ago, former Prime Minister Tony Blair pointed to China as an opportunity, not a threat. Indeed, China’s development is not a threat to anyone. We have never seized one single inch of land abroad and have no boots on foreign soil except under the UN peacekeeping banner. Over the past ten years, China’s annual import of 687 billion US dollar worth of goods has created more than 14 million jobs. The next five years will see China’s overall imports rise to 8 trillion dollars. 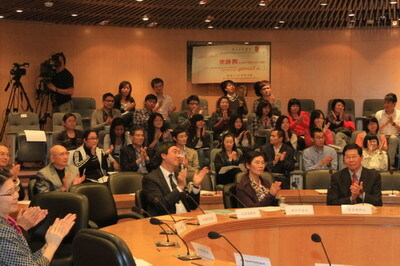 China’s rise has attracted a great deal of academic interest as well. A couple of years back, a Western writer published an influential book called: ‘When China Rules the World：The Rise of the Middle Kingdom and the End of the Western World’. Recently, another book, ‘Eclipse: Living in the Shadow of China’s Economic Dominance’, was out and soon nicknamed ‘When Renminbi Rules the World’. The list goes on and on. But take a close look at many of these books and you find that they invariably make sensational cases to grab wider attention. China has neither ability nor will to rule the world. According to Mr. DENG Xiaoping, China will never seek hegemony. We believe China’s development path fits in well into our national circumstances. It can’t be copied everywhere. Therefore, there’s no ‘Chinese model’ to speak of and still less the export of a ‘Chinese model’. Indeed there is a case to be made that the Western anxiety about China reflects a lack of confidence in the West. Of course, a narrow focus on China’s eastern seaboard may create an illusion that China has already joined the ranks of developed countries. First-time visitors may easily draw striking parallels between Shanghai and New York and point to Pudong New Area as China’s Manhattan. But China’s story is much more than that. We face a very big regional and urban-rural divide and our western hinterland remains poor and underdeveloped. Take Gansu province where I served as Assistant Governor. Some people in the outlying areas didn’t have easy access to drinking water, and some rural students never had access to computers or surfed the internet. What I always tell my British friends is this. China’s annual per capita GDP is only around 4,000 US dollars. That is one tenth the size of Britain. In addition, 150 million Chinese, or two and a half times the size of Britain’s population, live below the poverty line as measured by the one dollar per day UN standard. As a measure of China’s low productivity China creates 8 percent of the global GDP. But this is achieved with 46 percent of global iron and steel consumption, 16 percent of energy and 52 percent of cement worldwide. This is the real picture of China. This is a China that remains a developing country. Any open-minded observer of world affairs can see that it is difficult to copy another country’s political, economic and social systems. Many developing countries have tried yet failed to borrow the parliamentary system from the West. Absorbing that system did not bring widely anticipated growth and stability. Therefore, a social model cannot be transplanted in the real life on a silver platter like ‘copy and paste’ on computer. It runs the danger of a system crash because what’s working on Windows 7 is not compatible with MAC OS X. Last month, the passing of Steve Jobs, father of Apple, brought an end to a legendary life. His mourners and admirers didn’t hesitate to describe him a ‘great’ godfather in the technology industry. To me, his greatness is about ingenuity, perseverance and a strong confidence in the ability of his designs to win the hearts of Apple customers. That’s why Apple and Microsoft, though with vastly different computer systems and product lines, have both won success. Shouldn’t China and the West use this analogy and do the same? 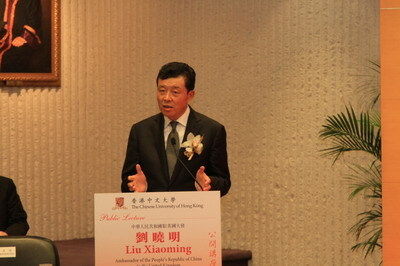 Building a new era of China-West relations, we need to free our minds and widen our horizon. Most essential is to echo the call of our time with an acute awareness of the general trend of human progress. We need to learn the success stories and lessons from world history and draw on the best of China’s traditional philosophy. Last September, China published a white paper on China’s ‘Peaceful Development.’ It outlines China’s vision for its relations with the world and its constructive ideas on building China-West relations. To sum up, the new relations between China and the West need three basic elements. Today, peaceful development means settling disputes through dialogue and negotiation and rejecting war and force. More important, it means China and West should rise above the dated ‘cold war mentality’ and seek to build peace and prosperity together. China is committed to promote world peace and stability and contribute to a sound international system. We don’t believe in the logic of ‘power means hegemony’ and won’t repeat the beaten track of the West. Instead, we have a culture of peace. Invasion and expansion are not in our genes. China itself was a victim of a whole century of imperial invasion from 1840. We have no intention to do to others what we don’t want done to ourselves. Since thirty years ago, China has come to realise peace and development as the theme of our time and the inexorable trends of multipolarity and globalization. China has confidence that we will break the ‘iron law’ of the rise and fall of powers and prove the ‘power means hegemony’ wrong. What China opts for is peaceful relations and shared prosperity with the West. It is natural for countries to have problems and differences among themselves. China and the West are no different. However, these differences shouldn’t stand in the way of our relationship. This relationship is not a zero-sum game. We can seek opportunities through healthy competition, expand collaborative areas, widen converging interests and achieve common development. In 1776, Adam Smith published his book ‘An Inquiry into the Nature and Causes of the Wealth of Nations.’ This is also known as ‘The Wealth of Nations,’ which laid the foundation for the Western economics theories. Smith pointed out in the book that in many cases, ‘led by an invisible hand’, ‘by pursuing his own interest he frequently promotes that of the society more effectually than when he really intends to promote it’. In other words, only cooperation can expand individual interests and benefit all. Being ‘led by an invisible hand’ is a passive behavior. By contrast, in today’s interconnected and interdependent world, China actively seeks a win-win partnership with the world, including the West. This is a partnership that may take different forms in different areas and that enables more of us to share prosperity. In time of crisis, we call for unity among all countries to rise up to challenges and build a better future. Harmony doesn’t mean standing apart in this interdependent global village. Then how can China and the West achieve harmony? Confucius taught about ‘harmony in diversity’. The United Nations Charter calls for nations ‘to practice tolerance and live together in peace with one another as good neighbours’. In addition, President Hu Jintao pointed to the need to ‘respect each other’s choice of social system and development path’. All these three elements offer a guide for the East and the West to accommodate and learn from each other with respect and equality. China has an old saying, ‘knowing the challenge is not difficult, but acting on it is’. Building a new China-West relationship is easier said than done. It won’t happen over night, but instead demands a strategic vision, a strong commitment and a down-to-earth approach from both sides. Building such a new relationship has no precedent, no ready solution and no existing theories. To chart a path forward, generations of Chinese and Westerners need to work closely together. This is our responsibility. But more importantly, it’s your responsibility as teachers and students. Soon after I began my duty as Ambassador in London, I was pleased to meet Mr. Charles Kuen Kao, former Vice Chancellor of this University. It was at a reception hosted by Britain’s Royal Academy of Engineering to celebrate his Nobel Prize for Physics. I congratulated Mr. Kao on his great achievement and wished him all the best. It strikes me that Mr. Kao is a role model for the teachers and students of this University and for all the Chinese. Half a century back, it took him 30 days for a journey by ship to Britain to pursue studies. Today, a Cathay Pacific flight only needs 13 hours for the same distance. If Mr. Kao’s fiber optics technology is deployed to transmit information between the two places, the time will be cut short to just 176 milliseconds. That’s a vivid reminder of our world getting smaller today. Yes, geographically, China and the West are thousands of miles apart. But modern technology has brought us closer to each other than ever.